Part of my daily 45+ minute walk with Doctor is listening to a podcast. It’s something that makes the time go faster while being entertained and/or educated. 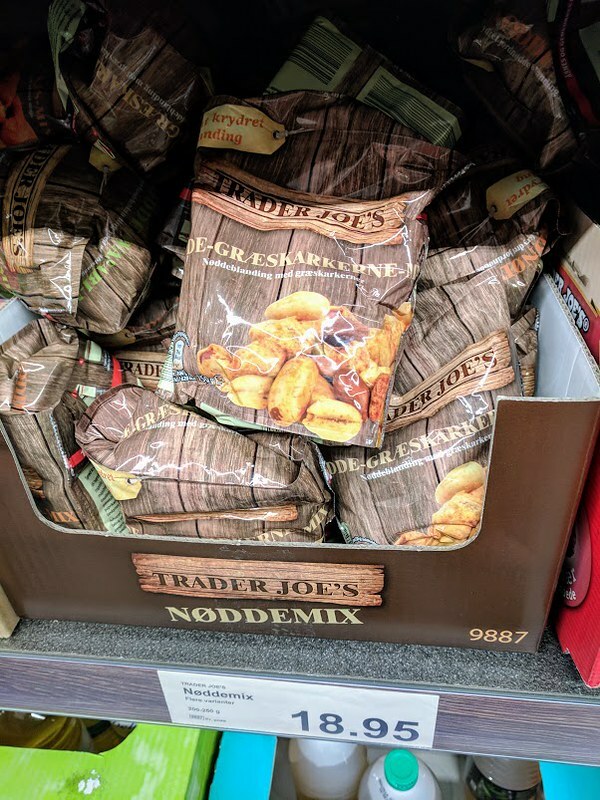 Podcasts in my rotation include Radiolab, NPR’s Pop Culture Happy Hour, The Splendid Table, The Sporkful, Nerd for a Living, Forever 35, BJ Shea’s Geek Nation and just recently added Inside Trader Joe’s. The last is produced by the popular grocery chain and only at five episodes—each roughly about 20 minutes long—they pack a lot of info into the inner workings. How do they find and source unique items from around the world? Learn about the ultra-secretive tasting panels to get new products onto the shelves. Discover its humble beginnings. What happened products no longer available that people miss. And did you know they use to sell sandwiches by the inch???? Needless to say if you’re an ardent fan who visits at least once a week to pick up your go-to item and maybe find a new favorite, it’s a must-listen and far too brief. 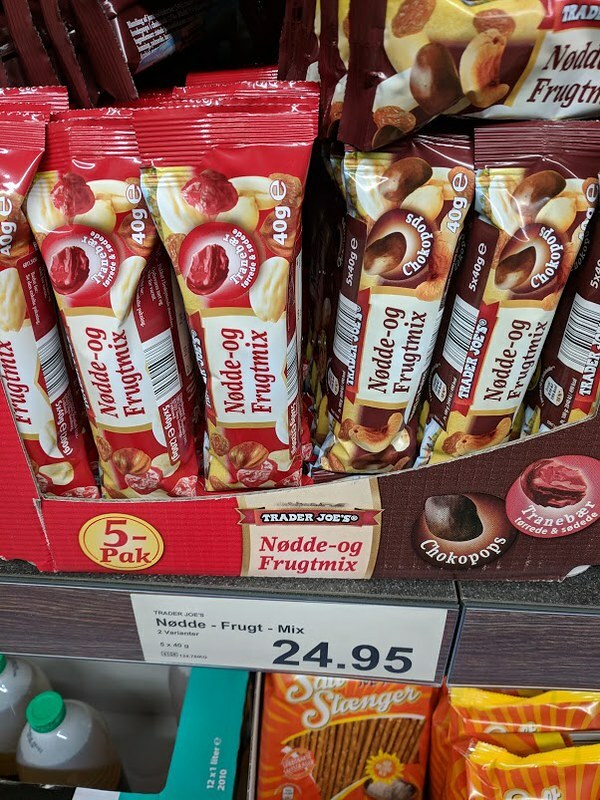 While on the subject, I’ll eventually write about our trip to Scandinavia but until then here are a few grocery store findings. In Copenhagen, we rented our first ever AirBnB that was located in the middle of the city. Since we had the advantage of a refrigerator, we chose to stock up at an Aldi a short walk away. 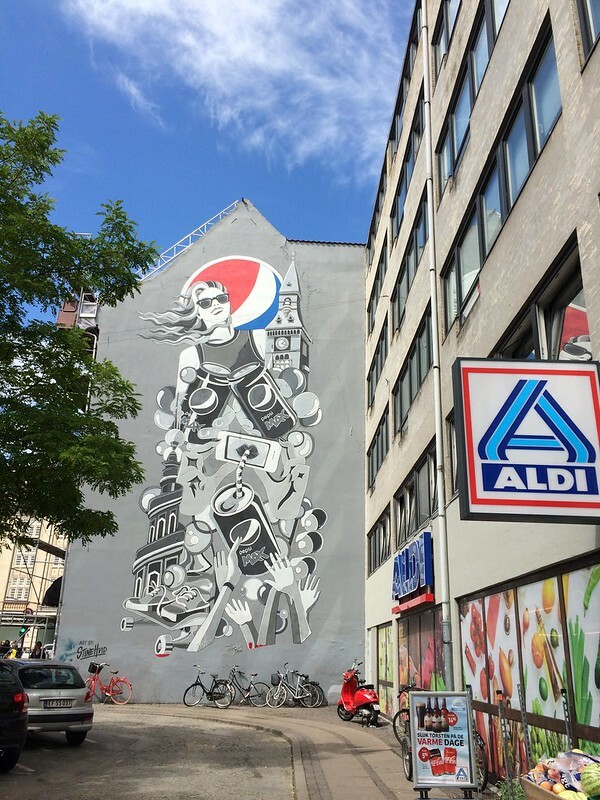 (Photo above of the same Aldi during my July trip last year.) 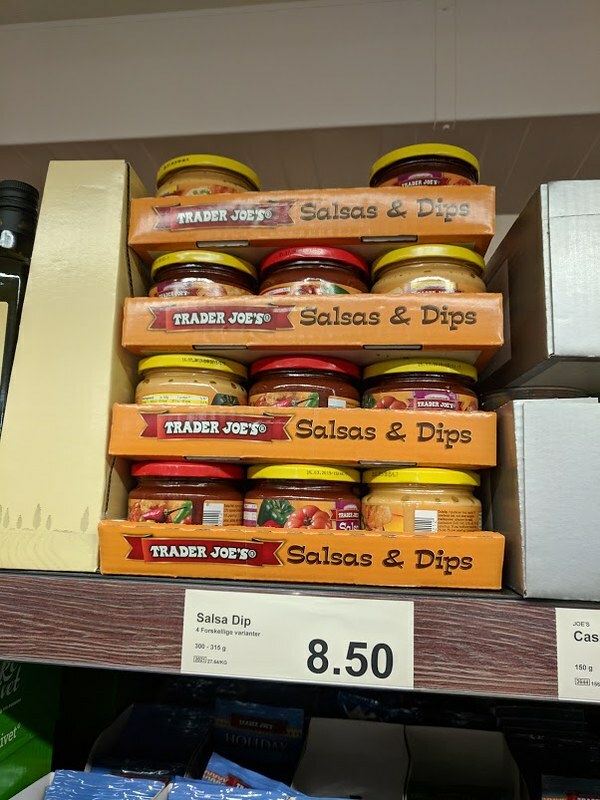 I had written about the connection between Aldi and Trader Joe’s before in my much maligned post but overseas, the connection was even stronger: we discovered that Aldi sold Trader Joe’s products. 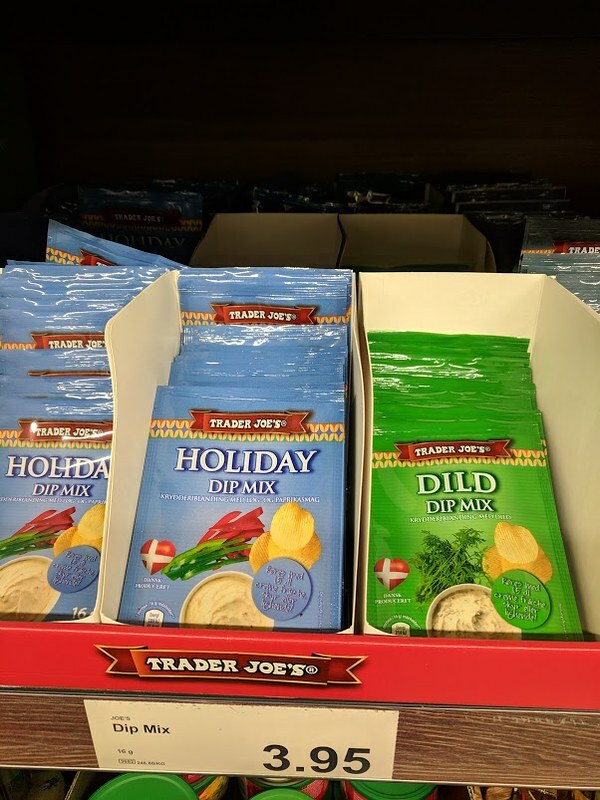 Along with regular produce, candies, cleaning supplies, packages of cigarettes and other grocery products, a few Trader Joe’s items were tucked alongside. 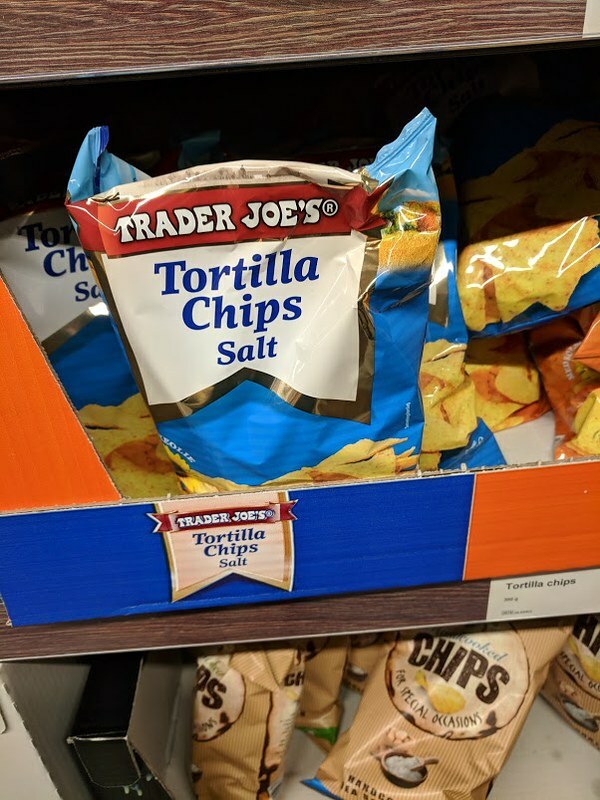 Most of the products in the snack aisle included trail mix, flavored potato chips, dip mixes and salsas – all with the Trader Joe’s label. 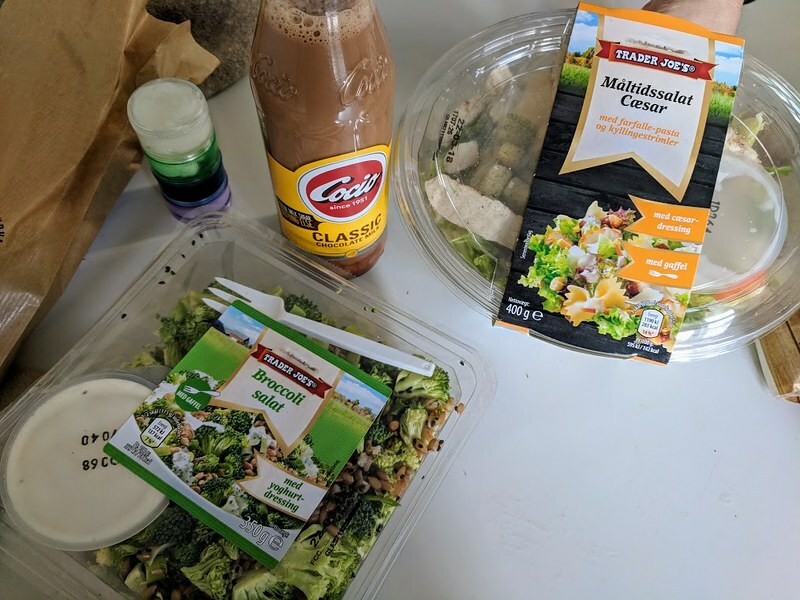 We had no significant amount of fiber during our trip so we relented and purchased Trader Joe’s branded salads along with Cocio, a Danish chocolate drink reminiscent of Yoohoo but so much better.